The irony isn't lost on me that while writing a blog series on the development of a personal organisation/task management app, I'm managing to consistently fall short of my self-imposed target of publishing a new entry every Friday. Despite turbulence in the planning, consistent progress is being made, and we're moving closer to a release. If you haven't spotted it already, a waiting list is now open for the mobile app beta, with a flashy new splash page to boot. As the survey questions would suggest, I'm planning a staggered launch of the beta, gradually bringing on more users, as the app becomes more refined. This should help keep the later stages of the development process more "agile", incorporating feedback from a range of users, and avoiding any nasty surprises from opening the floodgates to an app which hasn't been tested against any real audience. 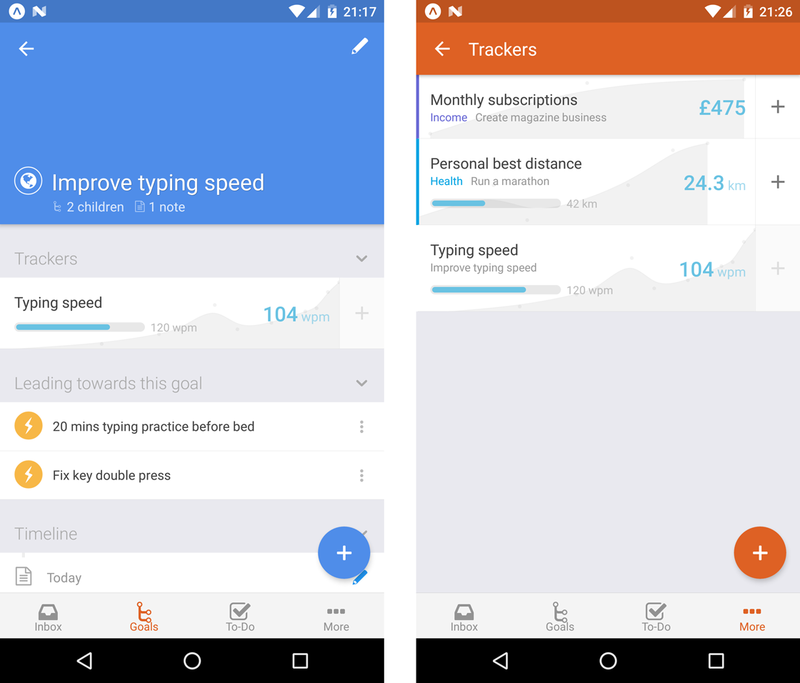 On the features front, trackers are now supported. Not 100% satisfied with these designs yet, so want to give them another shot soon, but glad to discover that SVG drawing techniques are working well in React Native, so I'll be able to reuse many of the same techniques I've been using for graphs on the web. This is the first feature where I've intentionally stopped short of implementing the full scope of what's available on the web. For now, the only tracker functionality available through the app is adding a new reading. The whole aspect of viewing/managing historing readings, and changing the behaviour of trackers, I'm not really convinced is part of the core mobile experience. Being able to add tracker readings quickly while on the go was sorely needed, but the more administrative tasks I imagine are better suited to a desktop computer and a larger screen. Even longer term, I'm not sure it makes sense replicating the full scope of the desktop app to mobile. I'll see what feedback I receive on this. One more thing I've been concentrating on recently is further polishing the syncing. One of my targets for even the first beta release is perfect 2-way interop between the web app and the new mobile app, i.e. changes made on one will seamlessly reflect on the other. This is tricky because the two have significant differences in their architecture, so this behaviour is far from symmetrical. Eventually I'll be bringing the web-app more in-line with how the mobile app functions (so it will also support undo etc. ), but for now this means covering a lot of edge-cases to make the two compatible. As you can see, much of the support is now in place for notes and attachments. For the same reasons as explained in diary #3, I've gone for a full screen note editor in the new mobile apps, and I'm finding it's a really nice way to focus in on a single note, removing the surrounding distractions. This video also introduces a big new feature: undo. This isn't just for notes, it's something that appears everywhere in the app a mutation is made. Renaming a goal, completing a to-do, changing a due due, even deleting an entire tree of nested sub-goals, will now all include a 5-second undo window. This was highly requested for the web app, but due to the architecture it was built with, it would have been extremely difficult to retrofit. 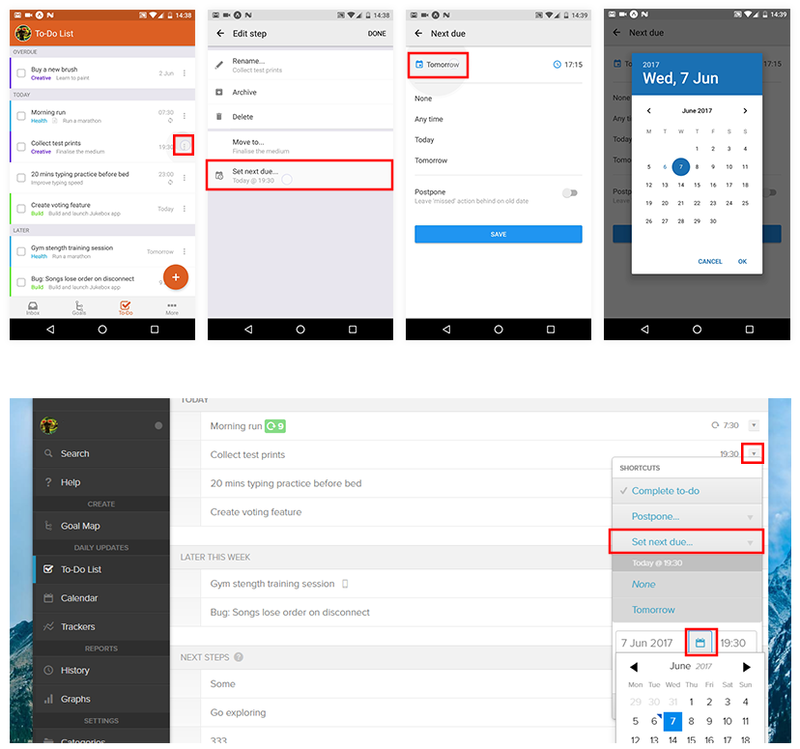 But as described in diary #4, the brand new architecture in use by the mobile apps allows for a lot of new benefits, this being one of them. Moving on to the fourth in this series of Friday updates, they're inching ever closer to actually being ready to publish on a Friday (it will get there one day!). While all the updates so far have been focused around visual and interaction design, to explain this week's progress we'll have to dive a level deeper -- to something much less apparent on the surface, but absolutely fundamental for providing a worthy experience for mobile: the move to offline-first. Why & how? Read on to find out. Over time it's become increasingly obvious to me (both through my own experience and extensive feedback!) that with something as core to one's life as goal and task management, the medium used to manage it should ideally be accessible at any moment. Whether it's a sudden flash of inspiration on how to move forward that needs to be recorded before it's forgotten, some reference notes that need to be accessed immediately in the heat of the moment, or just an overwhelming urge to review and reorganise one's plans during the daily commute, there are countless examples that disprove the notion that Nach should be solely used on a desktop or laptop with a stable Internet connection. By definition, a great offline-first experience is seamless. Whether an Internet connection is available or not becomes a detail irrelevant to the user, which the app abstracts away, internally making sure information syncs in both directions when possible, without any need for user intervention. But despite giving this illusion of simplicity, it introduces heaps of new challenges behind the scenes. The original Nach web-app opted for a more straightforward approach (to be honest, offline support wasn't even on my radar at the time). The server (a beefed up central computer and database, which stores and manages everyone's data) does a large amount of the work in providing the app. When a user visits the web-app, their web browser sends a request over to the server for the most up-to-date version of their goals, steps, trackers and so on. Once the user has their data, the server subsequently waits patiently to receive back any requests for changes. Shortly after launch I added support for web-sockets, a technology allowing any changes the server receives to be broadcast out to all other instances of the app the user has open, instantaneously. So any version of the app the user has open, across any number of devices, should always remain up to date with the others. This system works well, but with a significant caveat: it requires a stable Internet connection. As you may have experienced trying to make changes on the app during a period of no connectivity, you'll be greeted with the dreaded red box error message informing you to reload the app because your changes may not have been saved. This is because, as soon as it's no longer able to talk to the server, the web-app essentially becomes lost, like a child who's wandered into the wrong aisle of the supermarket, who decides its best course of action is to stay put and wait for an adult. More technically: there are several things the web-app can't figure out without the help of the server; both the app and the server need to hear about updates as they happen, or they'll fall into inconsistent states; and the app doesn't know what to do with updates if it can't just tell the server about them. Setting out to solve this is one of the main influences that motivated a ground-up rewrite for the mobile apps. Yes, our lost-in-the-supermarket web-app could have, with the right parental guidance, have one day grown up to be able to navigate supermarkets on its own. But that would take years, and when the option of adopting a supermarket-born native is on the table, who knows the route from frozen produce to baking supplies like the back of his hand, that becomes an awfully tempting option. As I mentioned, there have been many new challenges faced when trying to build up a solid foundation for offline support. The fundamentals are straightforward enough: everything needed to use the app will now be cached offline on your phone; the app will gain all the functionality it needs to be able to carry out key actions without a server; and when changes are made, the app will store up a list of these changes, ready to be sent to the server when a connection is available. But as with anything, the devil is in the detail. There are so many edge cases that require careful consideration to really make the system watertight. How can changes be resolved coming in from a device which has been offline for days, while other changes have been made elsewhere? What happens if a user makes overlapping changes to the same item from 2 devices before syncing? How can a user who has built up years of data keep within the much more limited storage and processing capabilities of a mobile device? Of course, there's a lot of fun in coming up with neat solutions to challenges like these. I've developed and been playing around with a system which I'm really happy with as a starting point for this, which nicely handles many of these edge cases. The ultimate goal is for changes to be accepted from any device, with the proper intention derived, no matter how long that device has been offline, or how much has happened since from other sources. There's a long way to go to reach that, but I'm really looking forward to getting out the first beta out, so people can start using Nach quickly and responsively, no matter where they are.